15 years of PLAYLearnThink! Click here to see how we celebrated this milestone in 2018. At PLAYLearnThink, it should be pretty obvious that we hold play in very high esteem. 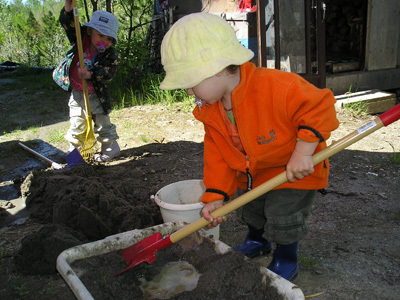 In fact, we know that play is cornerstone to children's healthy cognitive, emotional, social and physical development. We also know that it is important for adults' continued growth. PLAYLearnThink is a social enterprise dedicated to fostering creativity, nurturing imagination, promoting science literacy and encouraging life-long learning through play-based and inquiry-based exploration. Founder/educator Pierre Harrison believes that play is the essential element necessary to create a sound foundation on which to build a healthy, fulfilling life of learning. Observe any child or group of children completely engaged in play and you will see what we mean. Click on your language to view a pdf leaflet developed for parents and caregivers attending our community/family Adventure PlayDays: Let's PLAY! / Au Jeu. Click here for an excerpt from Pierre’s Learning Through Play workshop/talk. Click here for pictures of our Adventure PlayDay at Levack Public School. Click here for a video by TFO of one of our Adventure PlayDays where Pierre chats about the importance of child-directed play (in French). PLAYLearnThink would like to thank Brass Bell Family Resource Centre for bringing us out to communities along the North Shore of Lake Superior, Canada. During the 8 day, 2,200Km road trip, Pierre facilitated a full day Learning Through Play training workshop for ECE's in Thunder Bay. He then facilitated half-day parent engagement playshops and half-day ECE/Teacher playshops in Nipigon, Terrace Bay and Manitouwadge. Click here for their newsletter of the events. Click here for an interview on CBC regarding Free Range Kids (French).